The ColorpHast pH Test Strips Universal features sharp color contrast between squares for fast, accurate readings. Each strip won't bleed or add impurities to test solutions. The indicator dyes permit measurements of weakly buffered, darkened or turbid samples. 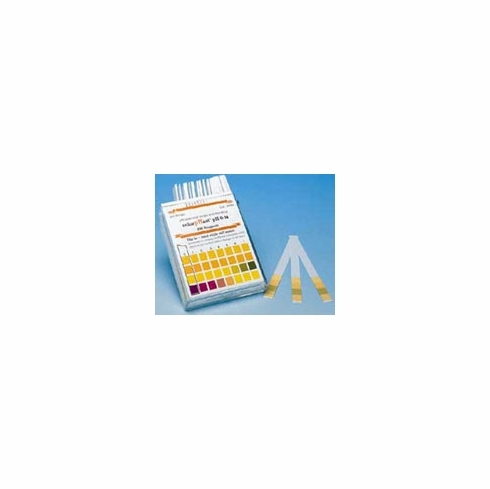 This pH test strips are easy and safe to use in determining pH level in almost any liquid. Fast, accurate, and easy to use, these pH test papers can be used in any pH experiment. Using four different indicators, the multi-colored pattern that results guarantees a high degree of precision. The ColorpHast 0-14 universal pH strips can be used with colored or turbid solutions and are guaranteed not to add impurities or bleed into test samples.